GPSWorldTraveler: WHAT THE “HECK” IS GPS ANYWAY? WHAT THE “HECK” IS GPS ANYWAY? Sometimes things just aren’t what they seem at first glance.... 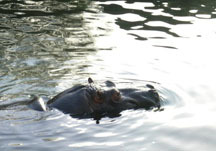 Sometimes like this hippo swimming in her pond, a lot of “surprise” is hidden underneath! Have you ever asked yourself where did GPS come from? What does GPS stand for anyway? And why is it so prevalent today... yet can’t recall any history about this form of technology? Those questions are answered in this article. As I said earlier first off, I am not a fan of technology. At best I find technology a bothersome tool and at every opportunity I resist - much like a donkey who has its feet dug into the dirt. My husband and son on the other hand are tech geeks. They love all forms of technology and between the two of them I am provided with many opportunities to experience this kind of stuff - I am not sure if they provide me with these opportunities in hope that I will come over to the “other side” or if they find sadistic pleasure in seeing me struggle. Typical with this pattern, my first experience with a GPS system was met with hostile resistance. I love maps. I love navigating. I am happy doing those things... and besides what in the heck is a GPS, anyway? “Without my knowledge, as I pack for a weekend visit to see my son, my husband who has purchased a GPS is down loading the GPS program onto our portable lap top, as he wants to try it out on this trip. Our son’s home is a mere 6 hour drive away and besides we know were he lives!